Neither Brandon Palaniuk nor Bryan Schmitt are strangers to hoisting trophies. Though, the ones both held this weekend probably felt a bit different. 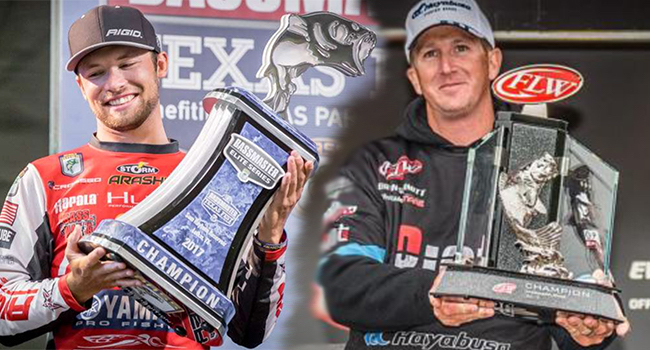 For Palaniuk, his win during the Toyota Bassmaster Texas Fest on Sam Rayburn broke a four-year drought for victories, which is notable when you consider he won three Major events in four years between 2010 and 2013. Meanwhile, Schmitt has won plenty, but always at the Local or Regional levels (he won the BASS Open on Champlain just last fall). So when he laid his hands on his first FLW Tour trophy at the Mississippi River it fulfilled a life-long dream. Palaniuk has already carved out quite the reputation in the sport, and his 17th-place ranking in the Majors Ranking certainly backs it up. However, he could easily be sitting in the top five if not for his back-to-back bombs at Okeechobee and the Classic earlier this year. Still, he’s now on a streak of three-straight top 20s. As for Schmitt, his victory bumped him up to 40th in the ranking, as he’s shown a quiet propensity for consistency. There’s also a VERY good chance he jumps up even higher next month, as he’s a guide on the Potomac River, which is where the FLW Tour heads next. Mark Rose started the tour year with back-to-back victories – which has never been done before –and now Schmitt has an incredible chance to end it with the same feat. Speaking of remarkable feats, Jacob Wheeler did what seemed impossible – he caught and surpassed Bryan Thrift. Wheeler’s third place at Rayburn, combined with Thrift’s mediocre finish at the Mississippi River, allowed him to claim the No. 1 spot in the sport for the first time in his career. Thrift’s finish in Wisconsin broke his streak of 11-straight top 20s in Major competition. That was hardly the lone shake-up in the top 10. Andy Morgan climbed up a couple spots to fourth with yet another top five, with Jeff Sprague now joining him in the top 10 for the first time (though Sprague was ranked No. 1 in our one-year Major Ranking for a bit), and there was plenty of shuffling in the top 20, with stalwarts like Aaron Martens and Scott Canterbury dropping out, and David Dudley and Alton Jones climbing back in.